Hillary Clinton has been diagnosed with pneumonia, fueling ongoing concerns about the Democratic presidential nominee’s health. Here’s what you need to know about this common illness, and why Clinton will quickly bounce back. Video taken yesterday during the 9/11 ceremony in New York showed Mrs. Clinton being taken to her car by security aids. She approached the car with wobbly legs, finally collapsing just as she was about to enter the vehicle. Clinton, as we now know, has pneumonia, and she’s currently on antibiotics. Her diagnosis may sound bad, but this illness is quite common and very treatable. The next few days and weeks might be rough as she battles a nasty cough and some fatigue, but she’ll likely bounce back fast. Clinton was apparently dehydrated and “overheated” at the 9/11 event, which in conjunction with the pneumonia caused her to fall ill. 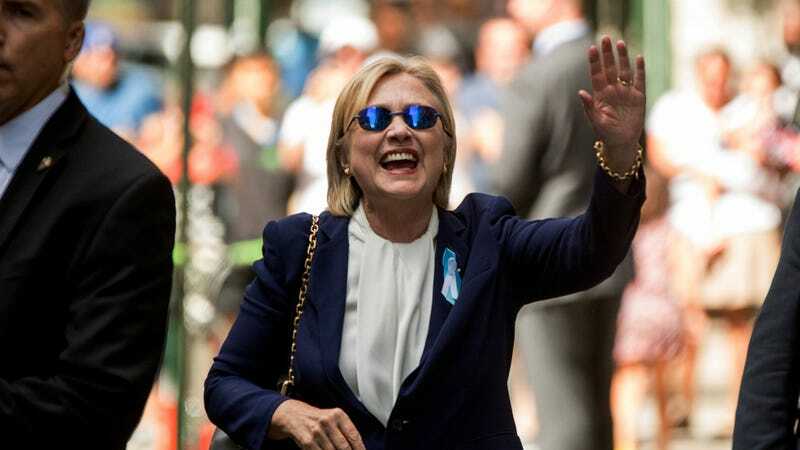 Soon afterwards, her physician, Lisa R. Bardack, said Clinton was re-hydrated and “recovering nicely.” That said, the presidential nominee has canceled a trip to California. The timing is bad. Not only is Clinton in the midst of a heated presidential campaign against Republican nominee Donald Trump, there’s been rampant speculation about the 68-year-old nominee’s health. Clinton has been uncharacteristically tight-lipped about her health, fueling speculation that she’s not as fit as she claims to be. But Clinton’s pneumonia diagnosis is hardly Earth-shattering. The National Heart, Lung, and Blood Institute estimates that four million Americans contract the illness each year, the vast majority of whom make a full recovery. Clinton will likely be no exception. Simply put, pneumonia is an infection in one or both of the lungs. It’s caused by many different germs, including bacteria, viruses, and even fungi. When microbes reach the lungs, the body’s immune system reacts by dispatching cells to attack them. But sometimes, these immune cells cause air sacs to form in the lungs, known as alveoli, to become inflamed or fill with fluids and pus, causing the symptoms of pneumonia. Clinton’s doctors didn’t specify the exact type of pneumonia that she’s dealing with, but she likely has bacterial community-acquired pneumonia. Clinton’s doctors prescribed antibiotics, which suggests she doesn’t have viral pneumonia—otherwise she would have been put on antiviral medicines. Symptoms can vary from mild to severe, and depend on a number of factors, such as the type of germ causing the infection, and the age and overall health of the individual. They include high fever, shaking, chills, a persistent cough with phlegm, shortness of breath, chest pain while breathing or coughing, and suddenly feeling worse after a cold or flu. Older people sometimes experience sudden changes in mental awareness, such as temporary confusion. Around one in five people with pneumonia will require hospitalization. Most can be treated at home. The key to getting over pneumonia is treatment and rest. Adults typically start to feel the effects of the medicine within about three days, and it usually takes about three weeks for a person starts to feel like themselves again, although sometimes it can take about a month to get over feeling fatigued. This bout of pneumonia isn’t likely to pose a long-term problem for Clinton, given that the vast majority of cases can be treated. There’s little reason to expect complications, as well, since Clinton doesn’t have a serious pre-existing health condition that we know of. The illness may slow Clinton down for the next several weeks while she recovers, and some rest might do her some good. As for concerns that this illness will somehow affect her ability to campaign and govern as president, that’s completely unfounded. But this episode should send a clear message about the need to communicate clearly. If Clinton is truly healthy, then people should know about it. Otherwise, the conspiracy nutters will fill in the information gaps with all sorts of nonsense.